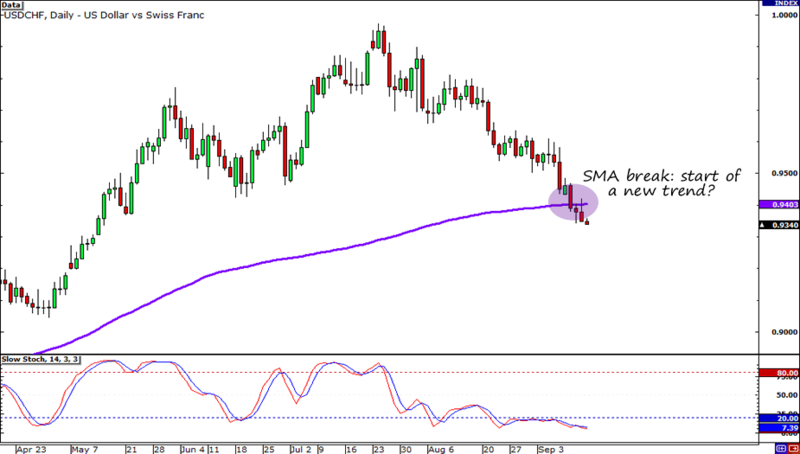 USD/CHF: Potential Short Next Week? I might have missed out on all the action, but I think I already know what pair I’ll be trading next week: USD/CHF! As you can see, the pair just broke support at the 200-SMA on the daily timeframe. As I said a couple of weeks ago, a lot of traders pay attention to the indicator, using it to determine trends. So could the break could indicate that the pair is about to start a new downtrend? The technical setup also matches very well with the fundamentals. For one, there was no change in the rhetoric of the Swiss National Bank (SNB) yesterday, which means it’s business as usual for them. Second, and more importantly, the Fed just announced another round of quantitative easing. In the last two times the Fed engaged in QE, the dollar was sold-off heavily for a few months. Quantitative easing, even though aimed to stimulate the economy, can be seen as negative for the domestic currency. This QE3 could result in an even stronger dollar sell-off, as it is open-ended. It means that the central bank doesn’t really have a set limit to the money it will print. According to the Fed, they would continue to pump stimulus to the economy as long as the U.S. labor market remains weak. That’s it for today! Hopefully, a good short setup appears or the lower time frames of USD/CHF.